Some respite from the wearing Sharia debate is in order, I feel. 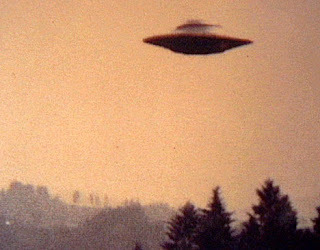 The Telegraph is reporting a "huge rise" in the number of UFO sightings in Britain, after several years of decline. According to figures released by the Ministry of Defence, 135 sightings were reported by members of the public last year, up from 97 in 2006. The most elaborate sighting was in Duxford, Cambridgeshire on April 12, where "a witness reported seeing fifty objects, each with an orange light, assembling in the sky before ascending." Did no-one else see it, I wonder? There has been a huge influx of UFOs. Absolutely enormous. There has been these huge formations than have been coming. We have had so many calls from people that have seen these huge formations. We have had call after call after call, from business people right down to ordinary folk in their cars. There have been some very close encounters that have been quite unnerving for the people involved. We have had other people reporting orb sightings. So what's going on? Given that around 90% of sightings are easily explained as misidentifications of normal aircraft and natural phenomena, and that only barking mad people believe they come from another planet, there are really only two explanations for the truly unidentified celestial objects. One is that UFOs are secret military test projects, which is why they are so often seen near air-force bases. The other is that they are psychic, or rather psychological, projections of prevailing myths and contemporary anxieties. There's probably some truth in both these theories, but I lean towards the second, if only because it also accounts for the 90% of sightings that can be "easily explained". After all, given that the vast majority of UFOs are explicable, one would expect the number of sightings to be relatively constant. Instead it fluctuates wildly. Clearly something causes people to interpret what they see as an alien craft, and it is that something, rather than the base phenomenon, that comes and goes. UFO "flaps" tend to happen at times of pervasive anxiety. There were many in the Fifties, when the Cold War was at its height, and again in the Seventies, a time of great international tension. In the Nineties, fewer people actually saw unidentified craft, but many came to believe they had been abducted by little grey aliens. The impenetrable mythology of The X-Files seemed to sum up that decade's obsession with corporate conspiracy. Then, around the time of 9/11, UFO sightings began to dry up. Islamist terrorism is perhaps too earthbound and primitivist a threat to lend itself easily to mythologisation in terms of scientifically advanced super-races from beyond the stars. Star Trek, it may be noticed, also finally went out of business. So, if the UFOs have returned, what might it signify? Possibly, that the easily-bored western public is fed up with the terrorist "threat". While governments continue to stock-pile repressive legislation to deal with Islamists, the warnings of mass-destruction at the hands of Osama's minions increasingly ring hollow. The imaginings of global doom are beginning to shift: towards the environment, most obviously, and fears for the tottering, unsustainable debt economy of the developed world. While worries about terrorism tend to shore up support for the political status-quo, environmental and economic concerns are more likely to undermine it. They are dangers, too, that are difficult to put a face to, being far more amorphous than a guy with a turban and a bomb. So people's minds turn once more out to the universe, from which perspective the earth looks less important and thus, perhaps, more easily saved. Perhaps someone out there can help. And so the aliens return.